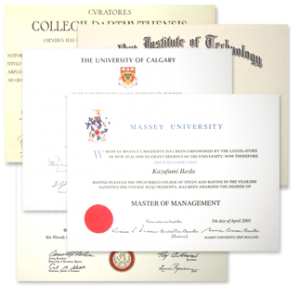 Our Deluxe Fake Degree Sets contain one Fake Diploma and Two sets of duplicate transcripts. 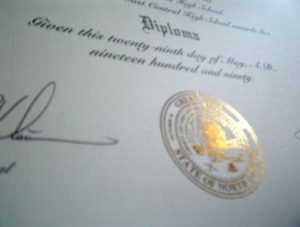 The Diploma will arrive in a Blue Diploma cover. Our Standard Deluxe is shipped via USPS Priority and our Deluxe Express Product is shipped USPS Express (Next Day in most cases). All of our diplomas are printed on Cream Ivory Diploma parchment and nearly all will contain a gold-fused seal of the actual university. Our Transcripts are printed on the highest level academic security paper and contain multiple anti-copy and security features. We even ask for a student ID on the order form, which you can add or we can generate for you. 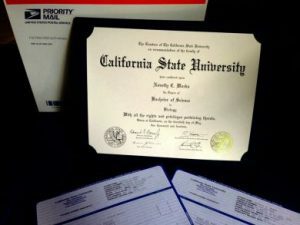 All of our Fake Diplomas and Transcripts are meticulously crafted for realism in mind. 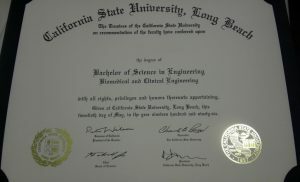 Our fake diplomas contain a gold-fused seal just like the actual, and our Fake Transcripts contain an additional embossed “Office of the Registrar” seal at the bottom. The Transcripts will contain the appropriate coursework to accomplish the desired chosen Degree and Major selected. For instance, a B.S. in Biology will denote 120+ credit hours that consist of the core major requirements, pre-requisites, electives and general education courses.